The first weekend in March, Local Progress members from across the Empire State descended on Saratoga Springs, NY for the third annual Local Progress New York (LP NY) Convening. Despite a winter storm that dumped 32 inches of snow in parts of the state, progressive leaders from cities big and small came together to learn, train, and work together to ensure New York becomes a more equitable and just place to live. This year’s inspiring keynote address was given by national leader and activist Linda Sarsour, who gave a sobering, historic breakdown of the policies that have attempted to suppress communities for generations. Her call to action to members was to be bold and brave in their local fights to resist the current actions coming from Washington. The following day, New York City Council Member Jumaane Williams spoke about how localities can effectively overcome decades of systemic racism and was followed by Local Progress founding board member Lea Webb and Council Member Brian Rowland from Prairie View, Texas, who presented a new tool to encourage community conversations about racial equity. In the opening plenary, New York City Council Member Brad Lander was joined by fellow Local Progress board members, Philadelphia Council Member Helen Gym, St. Louis Alderwoman Megan Green and Local Progress Texas Coordinator Mercedes Fulbright to discuss the enormous impact and growth of the Local Progress network across the nation. When LP NY members were asked to share victories from the last year, many of the victories or initiatives that people shared focused on policing, immigrant protections, and criminal justice reform – including Mayor Steve Noble announcing that Kingston would follow Albany in introducing the Right to Know Act. 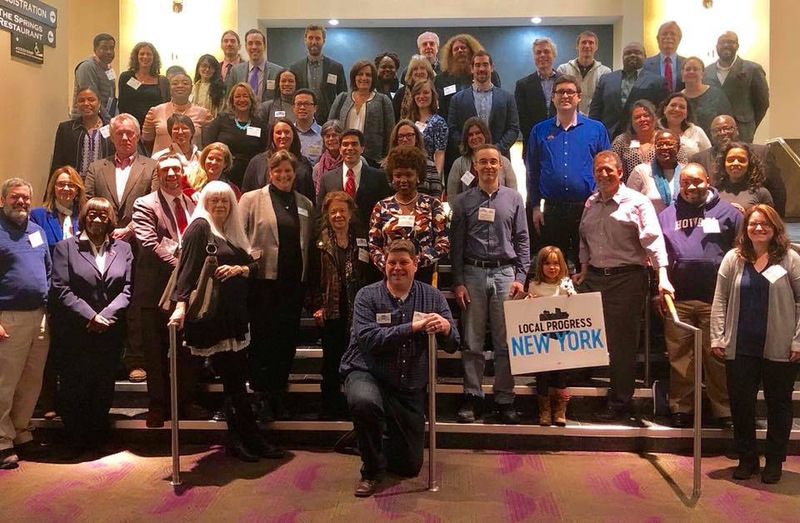 The convening’s second plenary launched LPNY’s two statewide campaigns to Let NY Vote, a statewide coalition of grassroots and legacy organizations working together to modernize NY’s voting laws, and pass paid sick days policies in Westchester and Albany counties. These policies will help thousands of workers across our state, and create momentum for more cities and counties across New York (and the country) to follow their lead.